Thirty-eight percent of the greenhouse gases emitted in New York State come from heating and cooling buildings. Therefore, it is critical that we address the nonelectric segment of the building sector, in addition to transitioning our electricity production to renewable sources. Renewable heating and cooling technologies, such as air source heat pumps, ground source heat pumps, and geothermal and solar thermal systems, could eliminate the on-site use of fossil fuels to heat and cool buildings and to generate hot water. 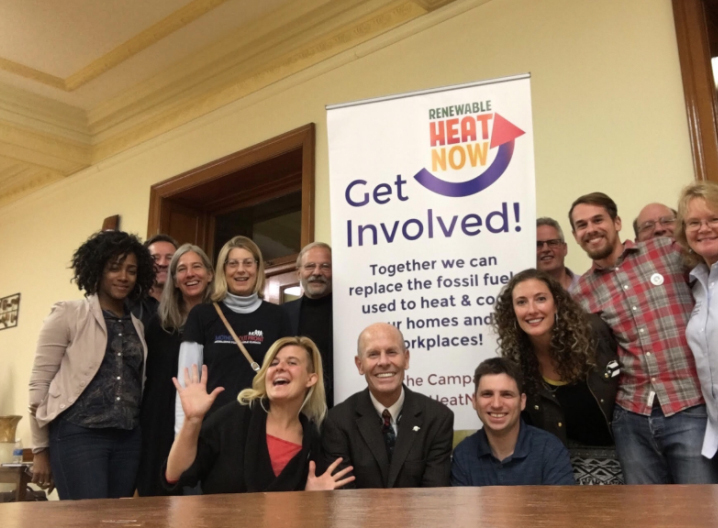 To build support for renewable heating and cooling technologies, New Yorkers for Clean Power partnered with Alliance for a Green Economy, NY-GEO, HeatSmart Tompkins, and Sane Energy Project to launch the Renewable Heat Now campaign. Accelerate the adoption of ground-source (geothermal) and air-source heat pumps in New York to reduce the amount of fossil fuels used to heat and cool homes and workplaces. Educate the public about heat pumps. Advocate for state policies to help all New Yorkers afford the switch to these renewable-ready heating and cooling technologies. a renewable heating and cooling program in your community.